Would you be willing to stake your life on your survival kit? I would. There are so many debates when it comes to the perfect survival kit. In my opinion, the items you choose to be in a survival kit can be very different based on the situation you see yourself in (maritime vs. desert survival) as well as your level of skill. For that reason there are a number of factors that determine what items you ultimately put in it. For this article, I will explain to you how I organize my kit, the elements that make it up, and hopefully provide some inspiration for your own. As always, I’d love to hear your opinions, so feel free to comment! Folding Knife: If you’ve ever been in a survival situation (planned or not) you know how essential a knife is. This I consider to be your most important survival tool. Purchase a good quality folding knife. My knife of choice is the Doug Ritter RSK MK1 – good quality, good price, and thoroughly field-tested (by me) for my needs. Fire Starter: This comes in second in order of importance for first-tier gear. For all you smokers out there thinking, “I’m all set, I’ve got my Bic” you might want to reconsider. A Bic Lighter is ok, but the fuel can run out quickly (especially if you’re not skilled at fire making) and they are a bear to start when they get wet. Instead of a fuel-based fire starter or worse (matches) I would recommend a ‘firesteel’. I recommend the ones from FireSteel.com or any of the Swedish FireSteel versions. These ‘strike-style’ firestarters are far superior to fuel based ones because they last forever and produce a hotter heat output compared to a Bic and an added benefit is I’ve never had issues taking them on a plane. The only downside is if you have no fire-making skills you’ll need to practice with it a bit. In the meantime you can carry with you a simple tinder made by mixing a little vaseline into a cotton ball which will easily light with this firestarter. Cordage: Cordage is a fundamental part of survival. It’s used for bowstrings, lashings, fishing line, snares, trap triggers, nets, tying down shelters and more. While making cordage from natural materials is always an option, and is not too difficult to learn, it’s always a good idea to have some with you at all times. I would recommend at least 10 feet of good strong cord – my favorite being 550 Paracord. I carry around 10 feet of it on my wrist at all times in the form of a bracelet I made. The benefit of Paracord is that not only is it strong (it has a 550 lb rating – hence the name), but it is made up of a strong outer sheath and seven inner strands that can be used for multiple purposes. Just carrying 10 feet of Paracord is like carrying 80 feet of cordage! Coin Sized Compass: These are those small, coin-sized compasses you see in many mini survival kits. Try to get one of the liquid-filled ones since it doesn’t have to be completely horizontal to work. Pinch Light: These little ‘pinch lights’ are perfect in a pinch (pun intended :)). They provide enough light for travel, for nightime camp activities (building a fire, setting up camp), and the LED versions last forever. Lockpicks: We live in an unpredictable world. Since I’m all about preparedness, there may come a time when you are held captive by terrorists, kidnapped for ransom (visit Mexico), or your simply locked out of your house. Lockpicks – and knowing how to use them – are a great addition to any EDC list. Hand-Cuff Keys: It’s not unknown for kidnappers and terrorists to use handcuffs to hold you captive. Since many cuffs use a universal key, carry a spare in a location on your person that is accessible with handcuffs on. Personal Protection Device: This could be a concealed carry pistol, mace, tactical flashlight etc. Just be sure you have the proper license if required. The key to the first-tier kit is to incorporate it as much as possible with what you wear. While the above items could probably all fit on a keychain, keychains sometimes get lost. If your knife has a clip, clip it to the top of your pants. Wear a cordage bracelet, or use strong cordage as lacing for your footwear. Attach a small firestarter to your belt. Find creative ways to ‘wear’ your first tier gear. That way it will always be available. Fixed Knife: In other words, non-folding. You’ll want a heavy duty, full-tanged knife that can take a beating and hold an edge. My favorite is the Bark River Bravo-1. If you want more details into what makes up a good knife checkout my article on how to choose a survival knife. Full-Size Compass: Even if you already have a small one in your first tier, then this should be upgraded to a full-size compass for ease of reading an azimuth. I prefer a lensatic compass due to the accuracy I can get in the reading. Water Container: Any collapsible, light, and easily carried container will do. Firestarter: Again, for insurance purposes you’ll want to duplicate what is in the first tier. I just include another firesteel that is a bit bigger than the one I carry on me. I also have a film canister filled with cotton balls mixed with vaseline. Water Purification Kit: In a small kit like this, iodine crystals are a perfect fit. They come in a small bottle (you’ll want to buy the Polar Pure brand) and it can purify up to 500 gallons! Flashlight: The ‘tactical’ flashlights out there are an excellent choice. Check out the SureFire brand. You won’t be dissatisfied. First-Aid Kit: This would be smaller than what you carry in your third-tier survival kit, but should include at least tweezers, a hemostatic agent (like QuickClot dressings), antihistamine, aspirin, antiseptic wipes, bandages, butterfly closures, moleskin, tape, and gauze. Simple Shelter: This could be a shelter half, bivy, tarp etc. This simple shelter should fit in your small kit and is mostly used to protect against the elements. I have a simple bivy and space blanket combo — both small and extremely light. Cordage: Again, I would recommend 550 paracord. Try to have around 50 feet. Energy Bars: Any high-calorie, nutrient dense bar will do. Signal Mirror: While any mirror will do, it’s best to buy the signal mirrors that have the hole in the center to accurately aim the reflected light. Lock Picks & Cuff Key: I have a more extensive kit in this tier. Multi-Tool: My Leatherman Wave has been a lifesaver for many tasks out on the road. This tool is so handy, it fluctuates between the first tier and second tier. Your third-tier survival kit is equivalent to what others commonly refer to as a go-bag, bug-out bag (BOB), or 72-hour kit. This kit should include all those items that could fit into a good-sized backpack that will sustain you for at least 72-hours. It should be easily accessible and ready to go at a moments notice. I keep mine at my house. The most important thing is that you pack your bag for scenarios that you may encounter. Individuals living in the city will have many needs different than those in the boonies, so be sure to prioritize around your needs. Personal Safety: This tier is in two separate bags: one is for personal security items and the second is for first aid. The first-aid kit is a bit beefier than what is in the second tier above. Shelter: Personal shelter and sleeping bag. I keep these on the outside of the pack. I love the Henessy Hammock. It’s lightweight and super comfortable. If you are with a family and personal hammocks aren’t an option, you’ll want to consider a tent. Water: My pack has an integrated water bladder that I combine with the Katadyn Hiker Pro Water Microfilter. I also include another bottle of Polar Pure (duplicated from the second tier kit). Since I live in an area where water abounds, finding water to filter is less of a worry. If you live in a more arid environment you may want to consider packing as much as you can carry. Fire: This tier includes the same items listed above, as well as an efficient camp stove and fuel. 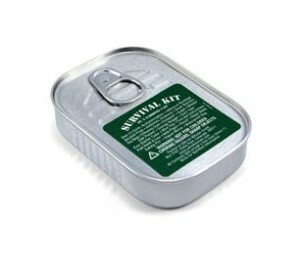 Food: I have some canned goods, but mostly freeze dried foods and MREs. Have enough for three days. Besides what’s listed in the priorities above, I also include several tools and miscellaneous items such as an entrenching tool, 100-ft length of paracord, fish hooks and line, headlamp, small hatchet, playing cards, and something to read. In summary, while the list above is what I use, it may not be suitable for you. It’s important that you organize and supply your kits with items specific to your environment, needs, and skill level. The best advice I can give you is to put your three tiers together and put them to use. Practice using the various items in darkness and light, different types of weather and different seasons. Take your go-pack on a hike with you to see if you can even carry it for an extensive time period. Drop those things that aren’t working for you and add others you think you’ll need. With time you’ll find a kit that is highly customized to you (and your families) needs. Best of luck! I owe the multi-tiered survival kit idea to Kevin Reeve, owner of OnPointTactical. I’ve known him for a number of years now and he’s a good friend and an incredible teacher. I highly recommend his school. Here in New England, we just recently had a severe ice-storm that brought the power down for over a week in some places. Those who were dependent upon electricity for water (such as a well pump) lost the ability to get water from their faucets and were forced to find other sources. Fortunately, many stores were still open so they were able to purchase water for drinking. But what happens in the case of a major disruption in the utilities? Katrina is a perfect example. Because the utilities were out and some of the water companies reported contaminated supplies, people made a mad rush to the stores causing a buying panic. As a result, this led to supply shortages on bottled water and food. It’s for reasons such as these that it’s absolutely essential that you have some store of water on hand. But what if your store runs out? What then? In this article, I deal with some of the most effective ways — primitive and modern — of procuring and filtering water. This includes ponds, lakes, water holes, reservoirs, outdoor buckets and barrels (not used for fuels or chemicals), your local water fountain and so on. Even a large plastic tarp shaped in such a way to catch rain water is an excellent cache. With a little creative thinking and some discretion there are lots of places in the neighborhood which provide good sources of water. In a pinch, your home can be a good source of water. The drinking water that remains in the plumbing will still be available if the water source is turned off. Just find the main drain in the lowest portion of your home and empty it into a container. If you have a hot-water tank, this will be your largest source of water available (around 40-50 gallons). One of the most effective (and one of my favorite) primitive ways of collecting water is from the early morning dew. The process is simple: Take a large cotton cloth (like your t-shirt) or a handful of long grass if you happen to be naked out in the bush 🙂 and begin to wick up the dew that has condensed on grass, large stones, the fresh leaves on trees, and other areas. After you’ve soaked the shirt or grass, just wring it out into a container or your mouth. You’d be surprised how much you can gather. I tested this one morning and was able to collect a gallon in about a half-hour’s time frame! Not only can you get quite a bit of water, but the best part is that it’s already distilled so you don’t have to purify it. As a caution, be sure you don’t gather the dew from poisonous or contaminated surfaces (poison ivy, recently fertilized/sprayed grass etc). The solar still was invented by two physicians working for the U.S. Dept of Agriculture and is a powerful way to collect water, even in some of the most arid of areas. It’s basically a primitive distillery. This technique extracts moisture from the surrounding ground through the principle of the ‘greenhouse effect’. Using solar energy, this moisture evaporates, rises and condenses on the underside of a plastic barrier above. To build a solar still, you’ll need at least two primary components: a container to catch the water (this could be a plastic cup, bowl etc) and a 6-foot by 6-foot (~ 2 meters by 2 meters) sheet of clear plastic. It helps to also have a shovel and a length of plastic tubing (similar to the kind found in fish tanks). Lay the plastic sheet over the pit, and secure the sheet with four rocks. Find a small smooth rock and push gently down on the center of the sheet until the sides of the sheet slope with about a 45 degree angle. If the pit was dug in the right dimensions, this should place the center of the sheet with the rock on top just a few inches above the container. Finally, secure the sheet by covering the edges outside of the pit with rocks and dirt. After about 2 hours, the air inside the pit will saturate with moisture and begin to condense on the plastic sheet. As the condensation builds it will begin to trickle down the sloped sides inside the pit and drip into the container. As the water collects, simply drink from the tube. To increase the output of the pit, you can also pour brackish water, gray water, salt-water or even urine around the edges of the pit. The solar still will distill the water (or urine) making it pure and clean for drinking. As a warning, do not pour antifreeze in or around the still since the poisons will evaporate with the water. While water filters come in all shapes and sizes, if you had to choose one I would recommend the microfilter. These are those compact, easily transported filters commonly used by hikers and outdoor-types. They are recommended just for the fact that if you had to take off quickly it would be easy to grab (better yet keep in a bug-out bag for that purpose). Keep in mind that although good microfilters filter out most bacteria, they never filter out all of it. The best insurance is to use them in combination with a prophylaxis such as bleach, iodine, or boiling (see below). As a general rule, you’ll want to use 8 drops (1/8th of a teaspoon) of non-scented liquid household chlorine bleach per gallon of water (2 drops per quart). Just put the bleach in your container of water, briefly stir, then let it sit for 30 minutes. My favorite source of iodine treatment available goes by the Polar Pure name. It’s a pretty easy method and can be taken on the road since the iodine is in such a small bottle. What you do is fill up the small Polar Pure glass bottle containing the iodine crystals, wait 30 minutes, and then pour off only the amount of liquid solution needed into a larger source of untreated water such as a canteen. After waiting a short time (following the instructions on the bottle), potable water is then available from the treated water. An advantage of using iodine crystals is that only a small amount of iodine is dissolved from the iodine crystals at each use. This gives you the capability of treating a very large amount of water, typically over 2,000 liters, with only a small bottle of crystals. You’ll want to be careful not to ingest the crystals using this method. Just because boiling is the most primitive form of water purification, makes it by no means ineffective. When done correctly, it will kill all water-born viruses that will cause you issues. To purify water by boiling, simply bring your water to a rolling boil and keep it there for a minute (add an additional minute for each 1,000 feet above sea level). That’s it! The obvious benefit to boiling is that it only requires a heat source and a container. However the down-side is that it requires quite a bit of fuel (wood, liquid, or electric fuel) to constantly boil water. This is not so much of a problem if you are home and have access to a stove and a large pot. However, out in the bush it’s a royal pain. I discovered this pretty quick on one of my early survival trips. I spent quite a bit of time boiling water and got so sick of it that I began to carelessly drink untreated water. Lucky for me I did not get Giardia. If you live in a fairly temperate zone, a great method is to use the power of the sun to purify your water. Even if you don’t live in the most sunny of places, you can still use this method although it will take a bit longer. What you do is take some small plastic water bottles (one liter bottles are perfect) or transparent zip-lock bags (like freezer storage bags) and place them in the full sun for six hours. If you don’t have full sun for that long, put them out for two days in partial sunlight. You’ll need full sun since a cloudy day will be ineffective. Similar to boiling, the sun will kill the bacteria and viruses that can make you sick. The obvious benefit to this method is that the sun’s rays are free to use and require no special set up. The downside is that it is not always available. While the solar still is primarily used for water procurement, it can also be used as an excellent purifier of contaminated water, gray water and salt water. Just pour the water in and around the still and let the sun do its work! With all the available methods to treat water, which is best? I would recommend using what is most readily available to you. You’ll also want to use some in tandem with others. For example, modern filters will remove many of the chemicals in the water but can leave behind the smallest biological contaminants. Iodine, bleach, and boiling kill off the biological contaminants but leave the chemical behind. If you have the time and availability to use multiple methods, by all means do it. However, in an emergency, don’t be so overly cautious to the point that you suffer dehydration. If you use just one of the above methods you’ll be in pretty good shape. What does water have to do with food storage? Well, you can have all the food in the world but if you don’t have water you won’t be living long enough to enjoy that food. In most cases, you’ll be around for only three days. One easy way to remember this is with the 3-3-3 rule. Generally speaking you cannot live longer than 3 minutes without air, 3 days without water, and 3 weeks without food. In an ideal world, we would all have a years supply of water stored away. However for most people, storing a years supply of water is not practical and in many cases not necessary (I’ll be covering water filtration methods later). At a minimum you should store at least 2 weeks (14 days) worth of water. You should have at least one gallon per person, per day, for 14 days: 14 days acts as a buffer zone that gives you time until the infrastructure problem is fixed or at least until you can figure out other water-procurement methods. If you live in an arid area where water is hard to come by then it’s absolutely important that you store as much as is practical. If you have the space, look into purchasing some 55 Gallon Water Barrels . Store the water in a cool, dark place: Light and heat break down plastics and can contribute to bacterial growth. Limit exposure to both. Preferably avoid moist areas where mold easily forms. Ideally PETE or food-grade plastic containers should be used: Used soda bottles work great in a pinch. Just be sure to clean it out well. I wouldn’t recommend used plastic milk jugs though. Milk contains a protein that doesn’t easily wash out and may contribute to bacterial growth. Plastic ‘water’ jugs with screw-on tops can be used although they need to be rotated yearly due to becoming brittle with time. Thoroughly wash your containers before filling them up: Wash the containers with warm, soapy water and sanitize them by putting a teaspoon of household bleach (non-scented) in a gallon of water. Pour this solution into the container and let it sit for about two minutes. Then rinse out with potable (suitable for drinking) water. Treat non-chlorinated water with bleach: Most municipal water sources are chlorinated so bottles can be filled up right from the tap. If you get your water from a well or other water source than adding bleach will prepare the water for storage. The general rule is 8 drops of non-scented liquid household chlorine bleach per gallon of water (2 drops per quart). Rotate the water regularly: If you are not storing commercially bottled water then it’s a good idea to rotate the water every six months. I find it easiest to just use the water, then when finished I’ll follow the steps above putting the newly-filled water container in the back of the storage queue FIFO style (first-in first-out). Storing water is an easy step. Instead of throwing out your used water jugs or soda bottles, clean them out and fill them up with water. With time the process becomes a regular habit and you’ll have your minimum 2 weeks of stored water in no time. Just be sure to start now!